For this year’s April A-Z Challenge I am blogging a series of sketches about the free people formerly enslaved on the Cleage plantations in Athens, Tennessee and their descendents. Click on any image to enlarge. Click on links for more information. John Cleage was born in Texas to Richard and Adeline Cleage, he was the oldest of 11 children, 9 survived to adulthood. The family returned to Athens before John was 1 and that is where he grew up. He completed 8th grade and was literate.In 1910 he was married for the first time to Annis Culberson. Around 1912, John moved to Cincinnati, Ohio, where the explosion mentioned in the article occurred. He later moved to Cleveland, Ohio. Here he married his second wife, Willard. They had one daughter, Evelyn. His mother and siblings moved north to Ohio. Through the years John worked as a laborer, porter and a groom. 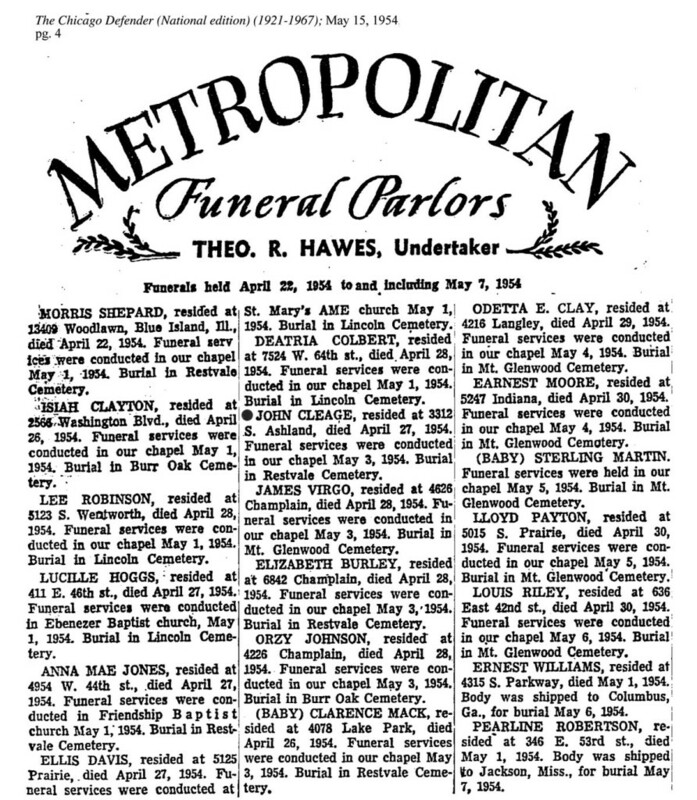 He moved to Chicago about 1928 and lost touch with his family in Ohio for decades. (I have a news item describing this reunion. Unfortunately, I haven’t been able to find it in time for this post!) In Chicago he married for the third time to Cornelius Taner. John’s draft registrations describe him as light brown complexion, brown eyes, black hair (until it turned grey) short (about 5’4″) and slender. John Cleage died on April 27, 1954 in Chicago, IL. He was 76 years old. Sounds as if John Cleage had presence of mind and quick reflexes, dropping face down into the muddy water, then going to rescue others. He lived a good half-century after that explosion, and for better or worse, his reflexes moved him through three women. Some people are survivors. When you say he lost touch with his family for decades, it sounds as if they reconnected toward the end of his life. Did they, and how did you learn this? Clever way of doing X. I have x, but am still stumped by Y.
I found a newspaper item that told how his sister found him after decades apart. I looked and looked for it yesterday but to no avail, couldn’t find it on my computer or online. I know it’s somewhere. I’ve got Y but with Z I will have to be creative. Sounds like an horrendous accident especially as there had been one at the same spot previously. More amazing research completed to be able to write this post. It reminded me of a mine accident, the lamp, the gas, the explosion. He certainly had quick reflexes. It must have been absolutely awful. Thankfully he survived to go on and live a long life. I admire your stamina Kristin to do this A-Z challenge. I don’t know if I could keep up with doing this many posts consecutively. I am too. And I am so glad there are only Y and Z left! Now I have to go back and source all my photos and other images and add the missing information. But not all in one day! Such an horrific accident, with the newspaper reports conveying the news so dramatically. My husband’s ancestors were miners in the north of England, and there was a story of seven brothers killed in a mining disaster. But I have never been able to verify this. I hope you will be able to find a newspaper article to confirm the story. I wouldn’t be surprised after reading about the horrible explosions in the mines. Wow! Very sad about the men injured in that explosion. I wonder what happened or what was said, to make John exclude himself from his family?